Handspring Inc. is known for its PDAs based on the Palm OS. Besides, it was first to demonstrate a VisorPhone console which turns a usual Palm into a smartphone. This device didn't cause a revolution, but it sold quite well despite its rather high price. After that its business wasn't so brilliant anymore and Handspring gave up production of ordinary PDAs and focused primarily on two smartphones - Treo 180 and Treo 270. Before we turn to the Treo 180, I want to say that hybrid devices are pressing out traditional communicators more and more. This is what Markus Bregler, Palm's European Head, meant when said that the main threat for PDAs came from smartphones which offered a different quality service level for users. The 180 model is available in two modifications - the 180th one equipped with the QWERTY keyboard, and the 180g which is identical to ordinary Palm PDAs (a keyboard is replaced with a Graffiti area). The 270 model will appear on the market only at the end of summer. It will come with a color display instead of the black-and-white one; the other characteristics are the same. Supposedly, the 180 will be produced as a CDMA version, but at present it supports only GSM900/1800. 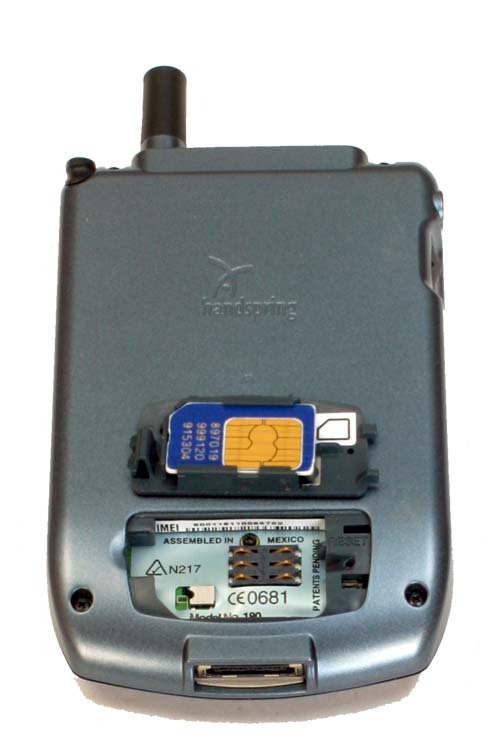 For the North America there is a modification where the GSM1800 is replaced with GSM1900. The Handspring Treo 180 has just one color available - Steel Blue. The Treo measures 11x6.9x1.8 cm (without an antenna which adds a couple of centimeters). In this parameters this device doesn't differ much from usual PDAs: for example, the Palm m500 measures 11.43x7.87x1.02 cm. The smartphone weighs 147 g which is not much. Because of the antenna it's inconvenient to wear the Treo in a jeans pocket, though it excellently fits a shirt one. Like in many other PDAs this one is based on the Motorola DragonBall working at 33 MHz. Open the lid and you will see the screen (the dimensions of the smartphone become greater, but it still fits the hand excellently). When the device is unfolded the upper lid is positioned at a certain angle to the screen because there is a built-in speaker. If you are afraid of making dirty the screen when you are speaking, or vice versa, you can use the headset the jack of which is on the left panel and which has a response button on the cable. In all other respects, this is a standard device. The speakerphone mode is excellent - you can use it both inside and outside. However, the battery in this mode runs down very quickly. Under the headset jack is a switch for scrolling through lists and for turning up and down a volume level during speaking. The switch has 3 positions and it is not so handy as the JogDial on the Sony PDA. The touch screen of the Treo is traditional for Palm OS based PDAs: 16 gray gradations, 160x160 pixels. The model we tested doesn't have a graffiti area; instead it has a QWERTY keyboard. The symbols on the key caps are white; there is the second row of symbols (to type them it's necessary to press a respective key and a blue button on the left). On the whole, the keyboard of the Treo 180 is pleasant and comparable to that of cell phones: both a form factor of the keys and impressions from operation are similar. Of course, this keyboard is meant for typing of just for short messages, but it excellently copes with its task. If you want to use your own alphabet, there is a virtual keyboard which can be adjusted to your liking. In the current version one can't assign other functions for keys, but they promise to add it later. When the lid is closed, the keyboard is covered with it, and the screen is seen through a transparent window which is very useful in case of incoming calls or events of the calendar. The lid doesn't cover a volume control and hot keys for the phone book, SMS messages and a web browser (information on the working applications is displayed on the screen). It's impossible to speak when the lid is closed because the microphone is located between the keys of the keyboard. If you don't want to open it, use the headset. As the graffiti area is lacking you can forget about shortcuts. Some programs using such shortcuts won't work because you won't be able to activate them. But there are not many such applications - not more than 5, and for two of them I have already found versions with extended functionality which allows working with the Treo keyboard. Besides, you can install something like the Jot program, and the problem will be solved completely. I recommend that you stick a protective film to the screen, otherwise it will be dirty. The simplest way to dial is by using the virtual keyboard, that is why you always leave your fingerprints on the screen, and it's inconvenient to take out the stylus each time because it comes out with difficulty. The stylus has a metallic core and plastic ends (but this is not a fluoroplastic tip). If you open the stylus from below, you will see a thin long stick used for PDA rebooting. In the upper end of the smartphone there is a ringer switch, then a power button to turn on/off the GSM module (long press). Two short strokes will turn on the screen backlight. Next to it is an IR port and a service indicator which is green when the device is connected to the GSM network, and red when it is recharged (it lasts some 1.5-2 hrs if the battery is flat). 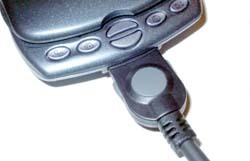 The Treo 180 uses a Li-Ion battery supplied with a charger which can be connected either to the smartphone or a synchronization cable. By the way, there is no a cradle - just a USB cable without the respective connector. According to the manufacturer, the device is able to work 3-4 weeks in the PDA mode (30 min a day), 3-4 hours in the talk mode or up to 100 hours in the standby mode. I tried it and the smartphone worked about 2 days in case of one hour of talking and 3 hours of using it as a PDA. In some cases (in the speakerphone mode) the battery status is indicated incorrectly: it can show that the battery is flat, though it is not true. The error is caused by the fact that the remaining time is calculated regarding the current mode. The indication will become true in a short time. The SIM holder is not usual (you can see it on the photo). Next to it is the Reset button for soft rebooting; for the complete rebooting with deletion of all data a standard procedure is provided. The Treo comes with the 3.5.2H4 Palm OS, that is why any software can be used without restrictions (except shortcuts). The operating system, like in all Handspring products, can't be updated. And I don't understand how they are going to modify the communicator, in particular, to realize the GPRS which is currently unsupported. This function is expected in September (2+1). Reportedly, the hardware is ready, i.e. hardware update won't be necessary. The company refuses the Palm OS because many functions are already realized in the adapted OS version of Handspring, and in the near future the company will use exactly these OSs. We won't describe the standard capabilities of the Palm OS because it is much written about on the Net. I just want to say that the memory size (16 MBytes) is more than enough, though additional memory slots are not provided. Note that the interface localization, as well as data input, make no problems. In particular, the programs which are now available on the market work well. So, we are mostly interested in the Treo as a cell phone. Press the first hot key and you will get into the menu which includes a virtual keyboard, programmable virtual hot keys, a list of phone numbers and a history of calls. Using the menu you can save any phone in the address book which is almost unlimited as far as the number of entries is concerned (well, in fact, the limit is 1,000). Each call has time, type (incoming, outgoing) and some other data (e.g. duration) displayed. The main menu got some new standard applications. The SIM Book allows you to read data recorded in the phone book of the SIM card; SIM srvcs (services) - if the card supports this function; SMS - for reading and writing short messages; you can choose for your text a phone number from the address book or a template. In case of a call the screen displays a menu which allows you to enable or disable the speakerphone mode or use any application. It means that while speaking you can look through your contacts, notes, documents or even play games. Unfortunately, the Treo doesn't support voice dialing and doesn't have a dictaphone. Among the standard programs there are a calculator, a post client and a browser (Blazer). The usual day-book is replaced with the DateBook+. The communicator is excellently synchronized with the PalmDesktop 4.0.1. The connection quality of the Treo 180 is superb: the sound is good, the volume level is loud enough. In the speakerphone mode the device works flawlessly as well. But the standard headset is not so good: the sound is muffled. Sometimes the ring seems to be too quiet, but I heard it well even at the noisy display. I can feel the vibracall quite well when I hold the device, and much worse when it is in the shirt pocket. You can choose a ringtone using the Ringo program. There are other programs as well, for example, MonkeyRinger, but it is not free. The keyboard suits well for typing short texts in English. Sometimes lack of the graffiti is embarrassing, but it depends on what you got used to. The dimensions and weight allow for comfortable wearing. 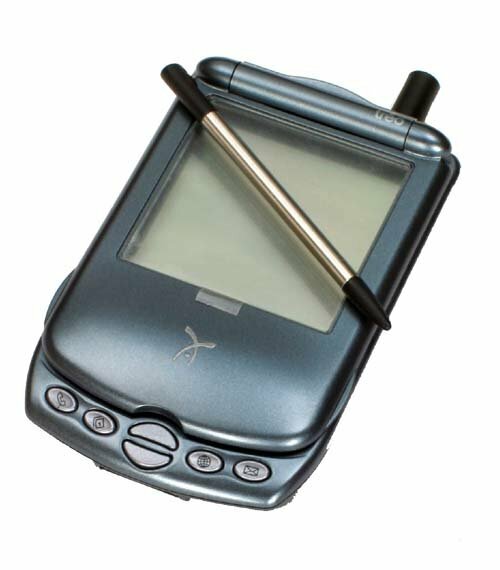 As a PDA the Treo 180 doesn't differ from other Palm OS based devices, except the limitations of Handspring, in particular, unupdatable OS, unexpandable memory and lack of additional memory slots, for example, MMC. It means that it's impossible to modify the device or expand its functionality. 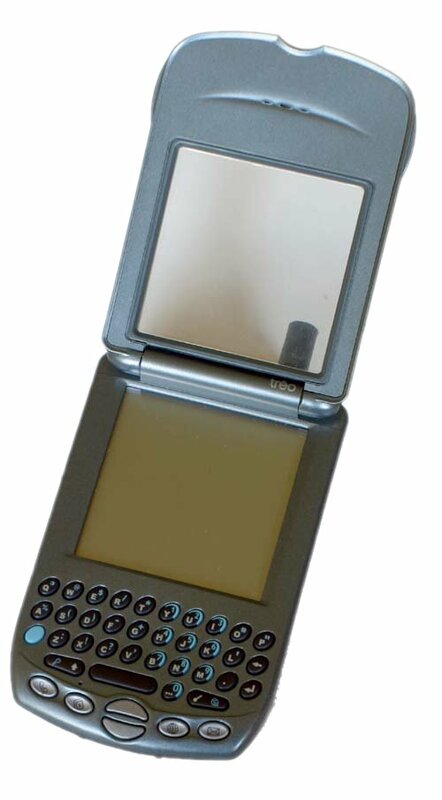 The Treo 180 is a hybrid of the latest Handspring PDA and a VisorPhone console equipped with a keyboard. In general, the solution is good, it works longer than other smartphones (2 days against 1 day of the PPC2002 computers), but it still works shorter than any mid-class cell phone. The Treo 180 is for those who don't talk much on the phone and who need a good organizer supporting installation of additional programs and data bases. This device is also useful for those who use SMS quite often. But the Treo still loses to a combination of the Palm PDA and a cell phone in price. At present both modifications of the Treo 180 are available in USA at $599 without service activation and $399 with service. If you buy the device without service at the manufacturer's site you can save up to $100 if you give them your old PDA (any model, even out-of-order). I think that the price will fall down in the near future because it won't be in great demand. I think in September it will be possible to get it at some $350-400. If not, Handspring will soon leave the market as they have nothing more to offer, and the current products are too expensive. After all, I think that the Treo 270 will appear together with the Palm smartphone.